Until recently, the Santa Fe was the best-selling Hyundai in both Europe and the United States. In those markets it has always represented good value-for-money as a seven-seater SUV and its popularity (and reliability) has done much to reinforce the marque's growing reputation for regular saloon cars. As its name suggests, the Santa Fe was primarily intended for America, sitting in the Hyundai range between the smaller Tuscon and the larger Veracruz. The Tuscon was replaced by the more stylish ix35 in 2010 and it was expected that the Santa Fe's successor would be the ix45, in line with the naming of the new generation of hatchbacks: i20, i30 and i40. But after careful consideration, Hyundai decided that Santa Fe was too familiar  and successful  to be discarded. It produced a new model, quite different in style and upgraded in quality, and left the name unchanged. There are not many seven-seaters of this size and price. The Chevrolet Captiva is a direct rival but lacking in most respects compared with the new Santa Fe. In Europe it also stands up against the Land Rover Freelander and the Honda CR-V, but both are somewhat smaller and neither offers a third row of seats. The Santa Fe offers front-wheel or four-wheel drive, six-speed manual or automatic. We drove a Premium 4WD 2.2 CRDi automatic, which in the UK retails for just short of Rs 28 lakh. 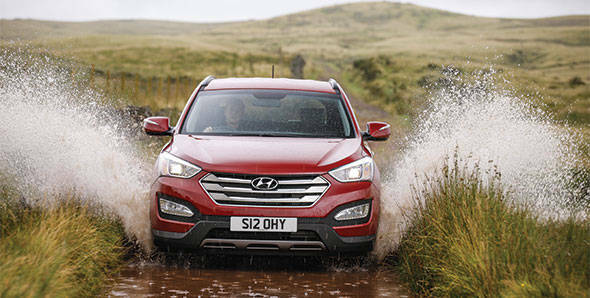 Hyundai's 2.2-litre diesel engine, with 197PS, is streets ahead of its rivals and, combined with the latest six-speed automatic transmission and its power and smoothness makes the Santa Fe feel like an SUV from the size and price class above. Its predecessor was noted for its towing capability, which is maintained for the new model. The chassis layout is as the i40  transverse-mounted engine driving the front wheels with drive to the rear engaged when needed through an electronically-controlled clutch pack. The addition of a locking device to provide permanent four-wheel drive with a 50:50 torque split front-to-rear puts the Santa Fe above the average 'soft roader', even if it does not have the ultimate off-road capability of a Land Rover or Jeep. For unmade roads and most cross-country motoring, the Santa Fe is fine. ESP and traction control combine to give a hill-descent control which is a boon for negotiating slippery downhill tracks. On road, the springs and anti-roll bars are sufficiently stiff for tidy body control when cornering at speed, while maintaining reasonable ride comfort. It is not a sporty car but with this combination of engine and transmission it is an easy drive. In this respect the Santa Fe hasn't altered much from the revised version of the previous model which appeared in 2010. The real changes are in the style and presentation. The wheelbase is the same as before but the new model is 3cm longer and 1cm lower. The new body has swage lines on its sides and upswept rear quarter windows, and a prominent wide, shiny grille and fashionable elongated lamp units. The test car had handsome 19-inch alloy wheels with gunmetal finish. The designers describe all this as 'fluidic sculpture' and 'storm edge'  whatever that may mean  but we think that the new look simply gives the car more personality. The interior shows a markedly higher level of quality. The facia is heavily stylized, not unlike the i40/Sonata, but generally well arranged  and better finished and made from better materials than before. The Premium models have no lack of features and equipment  electronic parking brake, sat nav with touch screen controls, rear parking camera, dual-zone climate control, electric folding side mirrors, auxillary sockets including USB port. The seat facings are trimmed in leather. The centre row of seats slides forward as one piece to extend the luggage area or facilitate access to the two individual third-row seats which fold flush with the boot floor when not required. Hyundai has raised its game in the last couple of years. Its latest hatchbacks and saloons are on par with the best from the volume manufacturers of Europe, Japan and the US and now it has brought the Santa Fe up to the same standard. As a seven-seater at a reasonable price, it goes straight to the top of the class.